Zetsche called for ''well-designed and executed EU industrial policy '' to help European automakers. 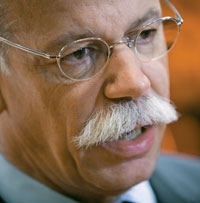 Europe's carmakers face a tough 2011 despite an improving economy, Dieter Zetsche, president of auto industry group ACEA. “The European automobile industry is recovering from the financial and economic crisis, but the macro economic circumstances in Europe remain very challenging,” said Zetsche, who is also Daimler AG's CEO. The comments appeared in a statement announcing that Zetsche had been re-elected president of the Brussels-based lobby group. Zetsche said that in 2011 ACEA will focus on sustainable mobility, including improvements in road safety and on its aim to enhance the global competitiveness of the EU automotive industry. Despite the crisis, Europe's automakers "have stayed in the fast lane on our way to sustainable mobility," Zetsche said. He added that a "well-designed and executed EU industrial policy can make a tangible difference” to ACEA's goals. ACEA represents the interests of European car, truck and bus manufacturers at EU level.